As they say, when it rains it pours. On Friday, Feb. 17 it poured in Carpinteria. Nearly 4.5 inches of rain fell during a 24-hour period, more than I’ve seen in any single day since my job made me start paying attention to such things. Infiltration and inflow, or I&I, is an industry term that refers to storm water or shallow groundwater that enters the sewer collection system during and immediately following a rain event. In the wastewater business, I&I is bad. There are several ways that rainwater gets into the sewer system. Surface flooding can inundate sewer manholes allowing water to enter the system through vent holes in cast iron manhole lids. When soils are saturated, rainwater can infiltrate the sewer system through cracks in underground manholes, sewer mains and sewer laterals. Finally, and most significantly, storm water can enter the sewer system through the illicit connection of roof drains, yard drains and other surface drains. No doubt all of these sources of I&I came into play on Feb. 17. Flows into the wastewater treatment plant were over three times higher than normal—we treated 3.4 million gallons as compared to just over a million gallons on a normal day. Fortunately, the treatment facility has the hydraulic capacity to handle these abnormal events, but pumping and treatment costs are dramatically affected by I&I. I&I presents an even bigger problem in the sewer collection system. The District has seven pump stations, located throughout Carpinteria, that convey wastewater to the treatment facility. These pump stations, and the network of sewer pipelines throughout our service area, are not designed to handle tremendous amounts of storm water inflow. Flows at some of our remote pump stations during this event were four or five times higher than normal, requiring District staff to mobilize emergency auxiliary pumps in order to keep up with incoming flows. Even with our pre-storm preparations, a major effort was required throughout the day to avoid sewer spills or overflows that would have otherwise resulted from excessive I&I. 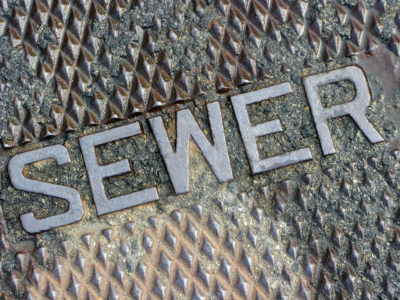 Sewer spills are serious—they can affect water quality, threaten public health and result in major fines or penalties. Much of our focus at the District is on maintaining and improving our sewer collection system to avoid spills and overflows. We have an ongoing program to rehabilitate or replace pipelines and manholes, eliminating sources of I&I, but to really be effective we need help from our customers. First and foremost, make sure that your roof drains, downspouts, yard drains or other surface drains are not connected to the sanitary sewer. District staff members are available to help verify this or to investigate any storm drains that may be inadvertently connected to the public sewer system. Second, consider having your lateral sewer—the pipe between your home and the street—inspected to make sure there are no cracks or breaks or other defects that would contribute to I&I. There are several local plumbers who are able to assist homeowners with video pipeline inspections and any required repairs. Your help on these fronts is greatly appreciated. I know we are all hoping for a few more rainstorms this season to fill our reservoirs and replenish our groundwater resources. Personally, I’m hoping it comes in smaller doses, but we will be ready no matter what. Click here to view the full version of our 2019 Spring Newsletter. Click here to view the full version of our 2017 Spring Newsletter. Click here to view the full version of our 2014 Winter Newsletter. Click here to view the full version of our 2012 Fall Newsletter. Click here to view the full version of our 2011 Spring Newsletter.